Thinking of getting your bachelor’s degree? Before you invest that time and money, check out Indiana colleges with the highest-paid graduates. Wondering what the best four-year colleges are by earning potential in the Hoosier State? 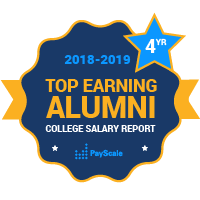 This list uses the Payscale database of unique salary profiles to identify the Indiana colleges with the highest-paid graduates. This list is ranked on the salaries of alumni who received a bachelor’s degree from the schools on this list, but did not go on to earn additional degrees. A high proportion of Indiana colleges are religiously affiliated. The Rose-Hulman Institute has a strong focus on STEM degrees (almost all degrees awarded are focused in science, technology, engineering or math subjects) at Rose-Hulman is likely a factor contributing to the high graduate salaries. But like many engineering schools, Rose-Hulman’s student population is predominantly male. Only about a quarter of students at Rose-Hulman are women. When we include salaries from alumni with graduate degrees, we see a big increase in the earning potential of graduates from Rose-Hulman Institute of Technology and Butler University. Butler University is famous for besting much bigger Indiana basketball powerhouses in national championships, but they also fare well in the realm of graduate salary. And Butler isn’t the only small school excel in earning power. DePauw University has a small number of students, but they come in high out of all Indiana universities for overall earning potential.